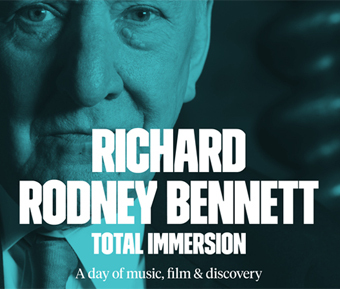 On Sunday November 27 the BBC Symphony Orchestra’s highly successful Total Immersion series turns its attention to the most versatile of British composers, the late Richard Rodney Bennett. Bennett produced over two hundred works for the concert hall, several operas and some fifty scores for film and television, as well as being a highly regarded jazz musician and songwriter. Throughout the day three concerts, a talk, a film and an open jazz session will seek to honour every aspect of his musical life. Explore Richard Rodney Bennet’s marvellous score in this screening of Sidney Lumet’s 1974 film adaptation of one of Agatha Christie’s best-known mysteries. The film features a star-studded cast including Albert Finney as the one and only Hercule Poirot, Lauren Bacall, Ingrid Bergman, John Gielgud, Sean Connery and Vanessa Redgrave. Chamber music by Richard Rodney Bennett, performed by students from the Guildhall School. An introductory talk about the life and music of Richard Rodney Bennett, featuring archive footage. Presented by Gerard McBurney in discussion with the award-winning poet and sister of Bennett, Meg Peacocke, and Gill Graham, Bennett's publisher and friend. A journey celebrating Bennett’s mastery of the orchestra with the BBC Concert Orchestra and the composer’s former musical partner Claire Martin. Reflections on a 16th Century Tune conjures up the spirit of Vaughan Williams and the Oscar-nominated suite from Murder on the Orient Express demonstrates his consummate skill as a film music composer. Conductor Scott Dunn also presents his own arrangement of Bennett’s Four Songs with jazz singer Martin. Claire Martin and her quintet, led by Gareth Williams, will perform a selection of the accessible and laid-back jazz standards which Bennett loved, alongside some of Bennett's original songs. Rumon Gamba conducts the BBC Symphony Orchestra & Chorus in a musical feast demonstrating Bennett’s versatility as a composer. Bennett’s Third Symphony is, unlike his earlier more extrovert works, mostly thoughtful and lyrical in nature. His dramatic cantata Spells sets a sequence of haunting invocations by Kathleen Raine whilst Anniversaries celebrates the 60th birthdays of both the BBC and composer Irwin Bazelon. The 1972 film Lady Caroline Lamb was responsible for one of Bennett’s loveliest scores.